Admit it. Sometimes nice, bland characters aren’t all that interesting or engaging. I’ve been an actor for more than 30 years, and I’m a character actor, which means I don’t play those handsome, kind-hearted “leading man” roles. I play the offbeat people, which suits me perfectly. Ask any actor you know whether he or she would rather play the hero or the villain. I’ll bet you at least 75% will answer: “The villain, of course!” That’s because the villains tend to be a lot quirkier and more interesting, and therefore more memorable to the audience. And we all want to be remembered, right? Yet when it comes to creating memorable narrator/host characters for eLearning, most corporations are afraid of presenting a character who is anything other than clean-cut, polite, and endlessly reassuring. After all, companies assume the narrator should always act as a direct representative of the company, and model only the best of corporate behaviors. But think about it: a lot of the workforce today has grown up glued to shows like The Simpsons, South Park, and Family Guy. Audiences have always loved characters with a few rough edges, and I think that’s truer now than ever. 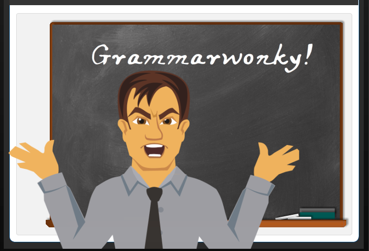 Over on the Articulate Forums, last week’s eLearning Heroes Challenge from guru David Anderson was to create a sample teaching a few elements of good grammar. I’ll freely admit that I’m one of those people who silently corrects other people’s grammar in my head all the time, so even though I was busy, I had to accept that challenge. And for some reason, thinking about teaching grammar made me think about Lewis Carroll’s famous poem Jabberwocky–a poem that can’t be criticized for any grammar issues, because it’s made up of nonsense words! Go figure. But the Jabberwock creature of the poem seemed like a good model for someone who is monstrous about insisting on good grammar. So I decided to create a grammar teacher who is anything but sweet and supportive. He’s an obnoxious, unapologetic grammar nerd. 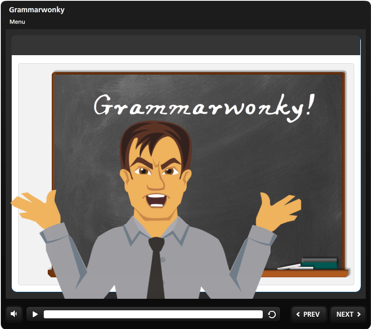 Or, as I coin the term in my new interactive eLearning sample, a Grammarwonk. And I decided to write a “riff” on the famous poem while I was at it. Click the image on this post, or go to my eLearning Samples page, and see if your own grammar skills can tame the Grammarwonk. And then think about the world of possibilities that opens up for your eLearning when you consider using more colorful–and sometimes, even less pleasant!–characters for your next project. Of course, sometimes you need to walk the straight and narrow corporate line. But then again–maybe that’s exactly when you shouldn’t. Remember: learning is best when it also works as entertainment. That’s a simple fact of human nature. Get in touch with me, and I’ll help you leverage that fact for your next project! PS: Make sure you click on the little “i” info button on the last slide for some cool “easter egg” information. The latest eLearning Heroes Challenge (#49) on the Articulate Community Forum was all about using your webcam as a quickie teaching tool. Moderator David Anderson keeps coming up with such great and creative challenges! And while I love being creative, the practical side of me is always saying “Make something you can use on your web site!” So I decided to make my webcast into a mini-tour of my eLearning Samples page. I used Articulate Replay to record this little project. While I remembered quickly that, like Articulate Storyline, it can’t record captures from my Mac environment, working within Windows it came together pretty quickly. I also learned that recording it all in one take wasnt working out–as a performer, I had no problems presenting it, but in each of three tries, my Macbook Pro’s mike input ended up with static in the audio at one point or another. And as this first version of Replay doesn’t really have advanced editing tools, separating out the simultaneous audio track wasn’t going to happen. Still, this exercise was about learning, and I learned a lot. Of course, I came up with a basic script beforehand so that I wouldn’t be fumbling for words. And I had to set up my neutral backdrop and a bit of lighting. And wait for that helicopter to get out of earshot. But once all the elements aligned, it fell into place, and I have to say Replay made it very easy to shift focus and add transitions. Have a look, and let me know what you think!